How does the colour green make you feel? (Generally, it is said to provoke feelings of balance, harmony, and positivity). The text The Shape of Texts to Come by John Callow is a great source of information that will assist in building teachers’ knowledge in this area. As a whole class investigate the meaning of the term ‘year’ and all the associated measurements (12 months, 365 days, 52 weeks, four seasons). Ask the children if they have a favourite month in the year. If so, why is it a favourite? Discuss the role of seasons in your context. This will be different across states and territories. Who do you think will be telling this story? Why? What clues have you used to work that out? a connection to their own lives e.g. I have a brother. a disconnection e.g. I don’t have big trees like that in my yard. Ask students to make predictions about the content of the book by looking at the cover (open to display both back and front). What kinds of travel are there? Can you travel but not move anywhere in space? What kind of travel would this be? What does it mean to treasure each day? What do the leaves, beetles, birds, and berries tell us to expect in the story? Why would the author thank her brother and sisters for ‘every season’? Which month is your birthday in? What is the weather like when it’s your birthday? What season does that month belong to? Chart the birthdays on a graph and discuss the spread of birthdays throughout the year. Students will investigate how things change over time. Allocate particular topics to students, allow students to choose a topic based on personal interest. The students read/view non-fiction texts in order to complete a before and after drawing. Ensure that vocabulary is built into the lessons preceding this task including words such as: before, after, then, changes, growth etc. The teacher may also like to discuss the use of comparatives and superlatives such as: bigger, smaller, older, oldest. Topics could include: babies to adults, seeds to trees, tadpole to frogs. Students can annotate or dictate the labels they wish to use. Alternately, students could sequence a set of images of themselves or draw themselves as they have grown from birth to their current age (be particularly sensitive with students who may not have access to photographs of themselves as infants because of issues with care or adoption). The focus is on their use and understanding of the vocabulary around changes and may include: change, time, different, after, before, then, in the end. The texts A Year on Our Farm and Anthony Brown’s Changes could help make useful connections. For the first reading, read the text straight through, modelling fluency. Ask the students to pay particular attention to the hints that they are given in the illustrations. Draw attention to how the illustrations and the text tell complementary parts of the story. After reminding students of the concepts of seasons, consider listening to Vivaldi’s The Four Seasons, and making inferences about how each piece of music represents a season. Are they able to match the concerto to the season? This resource for The Four Seasons is aimed at middle to upper primary but contains some sonnets that may be useful in assisting students to visualise each season. Use the sonnets to create a list of vocabulary that is relevant to each season and display on the word wall. Structure this lesson carefully, with a great deal of modelling and discussion. Conclude by discussing how life, including human life and plant life, are connected and support each other’s wellbeing and survival. Look for examples of this in the text. Now you have read the text right through, use the second reading to stop and explore each of the months as they are depicted in All Through the Year. Depending on the level of discussion, this may take more than one session. Ask the students to make predictions about each of the characters (age, gender) and the relationships between them. Ask them to reflect on how they are making these predictions. Now ask what can we tell about the characters from this first look at them? How is this like/unlike your family? Discuss the stereotypical portrayal of the mother and father. Allow students to discuss alternate family structures. Libby Gleeson’s Mum Goes to Work could be used to present one alternative. Infer why there are ‘lots of things to do and find’ and ‘staying up late’ is okay in January? Explore the meaning of ‘hand-me-downs’ and make inferences about why ‘shoes are tight’. Ask: Have you seen a tree like this one that loses all its leaves? Introduce the term ‘deciduous’ and explain that not all trees lose their leaves. Briefly explain that many people celebrate the time called ‘Easter’. Allow the students to note text-to-self connections if this is similar to their family, but also to acknowledge disconnections if it does not represent the cultural or religious beliefs of their families. Record all the special events discussed and make a chart that shows the variety of special events celebrated by class members. Ask: What special day is being hinted at on this page? Ask: What do you do to celebrate Mother’s Day? As before, allow disconnections if the cultural backgrounds of the students do not align with those presented. Take care to note that some children will not have mothers to thank on this day, and that perhaps there are other people in their lives that will be celebrated on this day. Compare this page to the introductory page. What has changed? Use Echo Reading (teacher reads one line, students echo using the same speed, volume, and expression), repeat, allowing for the students to enjoy the feeling of reading fluently. Discuss the relationships between brothers and sisters. Ask: What is good about having a brother or sister? What is challenging about it? What do our brothers and sisters teach us? Anthony Brown’s Tunnel could make interesting connections here. There are many words with long vowel sounds (rain, ride, home, train, steam, scream) and short vowel sounds (bud, sun, sing) on this page to discuss. What do you think this special day is, and why did she have to save up all year? What is a ‘dappled grey’? What other things do you think the children might do on this day? What is special about November? What are the children preparing for? Share stories of what families do on Christmas Day. Allow students to share their disconnections if this does not represent the cultural or religious beliefs of their families. Add to the special events chart. Use the shared writing technique to create a list of all the things that have changed over the year. Using the Language Experience Approach (LEA) have students select one season (or more) and depict what their families/carers are likely to be doing at this time of the year. Students can do this through drawing, painting, or collage. Prompt them to think about appropriate clothing, activities, celebrations and settings for the season. Students may label or annotate their drawing if able, but the LEA asks that the teacher scribes the students’ dictations on the work. Use the opportunity to ask the students how their representation of the season is different or similar to the one shown in the book. Alternately, have the students create the ‘background’ of their home or family at this time. Photograph or scan the image and insert it as background in an app or program such as Tellagami. Have the students create their own avatar, and record themselves describing what is happening in the background/season. Read the book Window by Jeannie Baker and compare and contrast it with All Through the Year. Baker’s book moves two years with each page opening so the changes are more obvious than the subtle monthly changes of All Through the Year. Discuss the different ways that the illustrations have been created. Discuss the different ways we read when we read a multimodal text (different reading paths, using images to create meaning, attention focused on different parts of the text). Teach children about the ‘salient point’ in an image – the part that draws our attention the most. Where do the students think the salient point is in the months of January, May, June, July? Discuss the use of colour as a way of drawing attention to salient points. Multimodal images can be discussed based on their use of: line, shape, colour, space, texture, composition, and perspective. Use the following pages to illicit the students’ thoughts about these elements. Line: How is line used to show action in January? Swirly lines can indicate action and movement. Shape: Consider the shape of the tree in the final pages. Rounded and smooth shapes can suggest comfort and security. Would this be the author’s intention with the tree do you think? How does that compare with the tree in August? Sharp, spikey shapes can indicate tension, and action. Does that match the picture? Colour: What is the special colour that pops up throughout the book? Red – can mean love, cheerfulness, warmth, excitement. Space: Why do you think the author used the two pages to show the tree in August? The use of the page draws our attention to different parts of the tree. Here the author wants us to feel drawn into the branches and feel them all around us. There is not much blank space so we could feel a little claustrophobic. Lots of white space can give a feeling of emptiness and isolation. See how the author uses white space to draw our attention on the page for June. Texture: Look at the different ways the author has created text for the leaves in March. How do you imagine the leaves feel to play with? Textures can be used to make things feel heavy or light, rough or smooth, jagged, slick, or firm. Composition: Why did the author use this composition? Many smaller pictures can be used to show different things happening at different times. Perspective: Compare how we are positioned as viewer throughout most of the book. Most of the time the illustrator uses an angle where we are looking straight onto the happenings, although there are changes in how close we are. Consider how March’s perspective makes us feel close and part of the action, while in February we are made to feel like we are standing back and looking on. Why might this be? Consider how the illustrator changes the perspective for June. We are now looking down on the action. Why might this be? Does it make you feel like you are an observer rather than part of the action? Introductory Page: Discuss the concept of rhyme. Tell the students that this is when the end of the words sound the same. After reading the text on this page again slowly, ask the students to identify the rhyming words (small/all, new/through, last/fast). Record and brainstorm other words that rhyme with these. September: Discuss the long and short vowel sounds in the words on this page. Long vowel sounds will include rain, pale, ride, home, train, team, scream; and short vowel sounds will include bud, sun, sing. Make a list and try adding to the words found. Final Page: Use a shared writing approach to construct a list of the things that have been seen or that have changed over the year. Focus students’ attention on the graphophonic relationships when asking them to record their thoughts. Use the curriculum content to guide this work. Divide the students into four groups and allocate each group with a three month sequence/season. Discuss the season and the associated events with each group individually, building their understanding and allowing them to consolidate their thinking using oral language. In these groups, students then use drawings (and labels if possible) to retell the season. Depending on ability and time, they may create one collaborative drawing or individual drawings. Pay attention to the students’ abilities to recall particular events and the actions of the characters at this time. Assess the provision of details about what the character would be saying, thinking, or feeling in that particular month/season. Have students create a Freeze Frame for each month. In groups of four or five (to represent the girl, boy, dog, tree, baby) have the groups study the page and develop a scene to be captured using a Freeze Frame. They should create a scene that occurred just before or after the illustration that is captured in the book. Use a ‘tap in’ technique to ask each student questions that they must answer from their character’s perspective. For example, select a student, tap their shoulder and ask “What are you feeling at this time? What would you be saying or thinking at this time?” The ‘tap in’ technique will need to be heavily scaffolded if unfamiliar to the students. No props or costumes are required for the Freeze Frame activity. Either photograph the students in their Freeze Frames, or organise 12 groups to dress up, and show action for a particular month in order to be photographed. First brainstorm events that occur each month that are relevant to the students e.g. Book Fair, Sports Carnival. Use a digital program such as PowerPoint or MovieMaker to have each group create a multimodal image with their photograph by adding speech bubbles, labels, descriptions, or sound and audio. Discuss with the students how reading multimodal texts requires a different kind of reading. For example, we need to read the pictures to get meaning too, we don’t necessarily read in a line but can choose different reading paths, and we choose where we focus our attention. All multimodal presentations can then be compiled to create an All Through the Year digital text. Once the students have practised their Freeze Frames, have them present to the class, including responding to the ‘tap in’. Photograph their Frames, print a copy for each student and ask each student to annotate the picture, sharing their thoughts as if they were the character. For example, a child in the role of the young girl might write, “I am fighting with my brother in the tree house because he thinks he is the boss”. To scaffold this, ask the student to identify the who, what, when, where, why, and how of the picture. The annotations could be scribed, an act of shared writing, or completed independently by the student. Find out more about the author Jane Godwin on her website and through an interview. Visit Anna Walker’s website and learn more about the illustrations in All Through the Year. This Teacher Resource for using Vivaldi’s The Four Seasons has been created for upper school classes, but has some valuable sonnets that could be read to the students. It was created by the Canada’s National Art Centre. The Bureau of Meteorology explains how Indigenous seasons match European Seasons. Baker, J. (1991). Window. London, UK: Walker Books Ltd This book shows a changing world from a window. Carle, E. (1991). The Tiny Seed. New York, NY: Simon and Schuster Books for Young Readers. This book shares the life cycle of a flower. Gleeson, Libby (2015) Mum Goes to Work shows an alternative family structure as does Family Forest by Kim Kane (2011). Pascoe, K. & Hurst, E. (2010). My Boots in Season. Mount Kuring-gai, NSW: Windy Hollow Books. 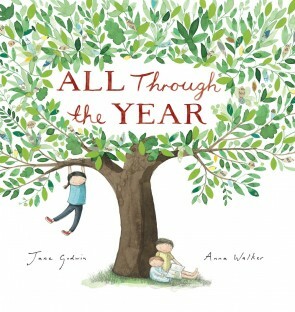 This book follows a family of four and their gumboots through the seasons. Lucas, D. & Searle, K. (2005). Walking with the Seasons in Kakadu. Crows Nest, NSW: Allen & Unwin.This book follows the seasonal calendar of the Gundjeihmi-speaking people of Kakadu. Beyond the Script: Part Two by Robyn Ewing and Jennifer Simons is a useful teacher reference. The Shape of Texts to Come by John Callow, published by PETAA is a useful reference for more information on visual literacy. Digital app Tellagami could be used with children’s drawings. Time lapse of plants growing. KYLIE BRADFIELD is an academic at the Queensland University of Technology where she lectures in the Early Childhood and Primary Education programs. Kylie is passionate about literacy, language, and literature as well as education in general. She also contributes as a consultant for Queensland schools in the creation of programs and in providing professional development to teachers. Kylie is currently undertaking a PhD investigating teachers’ understandings of the teaching of children’s literature.